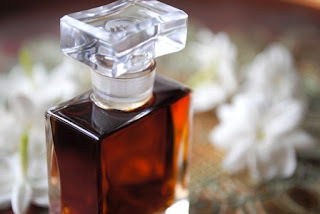 Perfume-Smellin' Things Perfume Blog: Foodie Sunday: “The Return of the Birds... My constant love affair with Food, Cimbalom and a fabulous giveaway! What am I planting? Geraniums, iris, heritage roses, butter lettuce, tomatoes, jalapeno peppers, mint and sweet woodruff. My bulbs are already in the ground with snowdrops expected first. I will be planting roses,daisies and lilies,herbs and tomato plants. I am so ready for spring and am waiting for my daffodils to poke through the soil! We're still figuring out what grows well in our cool coastal climate. So, from the good experience of last year we'll be planting radishes, and the greens grow pretty well, especially chard, but we're kind of tired growing it. We already have thyme, mint, and lemon balm and might add sage, rosemary and tarragon. your posts are always so evocative, Beth! I really need to try Roxana perfumes. I am not really planting anything- didn't reserve a spot in the garden in time- but if I could I would plant tuberoses and mint.. Farmers market is one of my favorite 'things' about living in California- fresh produce all year through! What a beautiful article! I will plant cherry tomatoes, strawberries, peppers, and maybe sugar snap peas. And basil, of course! I should get on that soon, I guess...thanks for this fantastic chance to win. I have been wanting to try Roxana's scents for a while, so maybe this will be my chance! Oh my goodness! I am moving, but I know I'll bring my little olive tree along. Once settled, I'd love to add some mint, and maybe a rose-scented geranium or lemon verbena. I have already planted a tuberose I bought at the Farmer's Market - of course there was a cold snap and it may not have made it. We just cleared a couple of trees that blocked all my light - I will hopefully be putting in some lettuces and flowers. Too late for a rose, perhaps, but I will look. It's a new beginning. Hi Beth, it's Autumn (fall) here in Australia and sadly, I'm not a green thumb. I am totally in awe of people who are but it just seems like there is so much to learn I wouldn't know where to begin! Just a comment on Cimbalom - last year I sampled a collection of liquid and solid perfumes from Roxana and I was absolutely delighted. I used up all of my cimbalom pretty quick smart, which at the time was only available in the solid. It's a very beautiful scent. I think she is amazing and your story of visiting her home was magical. Thanks for all of your awesome posts! Hello Beth...you have conjured the vision of what Californians do th their visitors...seduce them with the bounty that is Californian Hospitality ! I have tomato plants set out already a foot high , my basil seedlings are coming along in the greenhouse , the pepper plants are small , but I planted them the other day . Here in Florida , Spring comes early ! I met Roxana at Sniffa a few years ago , and posess a sample set of some of her fragrances . Vespertina and Chaparral are gorgeous , but I have never sniffed Cimbalom - would love To ! Thanks for the lovely draw . Dill, thyme, basil, parsley, and petunias are the sure things. Can anyone suggest some great-smelling flowers that grow well in containers? I live in zone 6. We'll be planting spinach & snowpeas, followed by eggplant, at least 4 varieties of peppers, yellow tomatoes, zucchini & kale. And morning glories & moonflowers, and I'll try catnip again.....thanks for the opportunity. Can't wait for spring here in Cleve as well! We are planting cukes and yellow pear cherry tomatoes! And if I can ever get some good poke cherry seeds, that too! 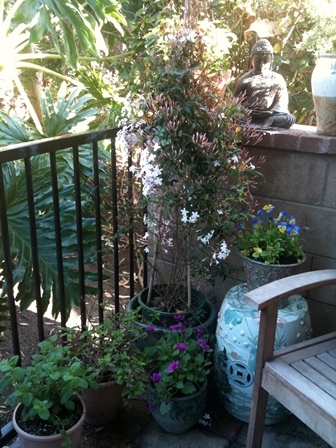 It's container gardening for me on the patio. Pots of basil, thyme, mint and chives. My indoor fig, jasmine and oleander will summer outdoor as well. I don't have a garden per se, but if I did I would plant tomatoes, lettuce, cucumbers and lots of different herbs for lots of delicious summer salads! Beautiful post! Tomato plants in containers on my balcony, and hopefully white ginger lilies if I am fortunate enough to locate some seeds or rhizomes! With my two potted gardenias and potted jasmine, I sadly won't have very much room left for anything else on my apartment balcony. What a great post, Beth! I can almost relate living here in Columbus, Ohio, though we don't get the winter nearly as much as you do up North. No garden for me, as we rent the house we're living in so can't go too crazy. But we do have a lilac bush that should be starting to show soon if it ever stays warm! And after your description of Cimbalom, I really can't wait to try it! We're in a very shady neighborhood on a very shady lot so all we plant are partial sun annuals like impatiens and dragonwing begonias. We have a wide variety of hostas, ferns, bleeding hearts, and oakleaf hydrangeas that thrive in the shade of old beech, maple, oak and sycamore trees. We wish we had enough sun for tomatoes, lettuce, peppers and the like! hello fellow NE Ohioan! Gorgeous post! I'm hoping to grow okra, pickling cukes and asian eggplants (and of course tomatoes and peppers) - not many flowers or herbs this year. It's our second summer in the desert west of El Paso. I learned some things last summer, and hope to have a more successful gardening year. Tomatoes, eggplant and peppers (because they do so well), lavendar and sage and rosemary, and probably some new fruit trees now that we have moved our back wall and have an extra 15 feet of space to fill. Beth, what a love letter to California, sunshine, long growing seasons, and the idea of terroir. Your description of your visit and meal with Roxana sounds perfect. I love both Cimbalom (spring/summer - life, heat, desire) and Q (fall/winter - fallowness, woods, potential, embers), and truly believe Roxana is inspired to create these incredibly beautiful scents by where she lives and who she is, and that the scents embody all of these things. I feel that every time I wear them. I won't be planting my garden this spring because of an upcoming move, but in the past I have planted basil, tomatoes, peppers, eggplant. The anise hyssop comes back on it's own every year. Dahlias and poppies in the front and veggies in the back.Lots of herbs everywhere. My Daffodils are almost gone now! I long to return to California where I grew up, mainly La Jolla and Del Mar. I have been in Vancouver, BC for 40 years! Arghh! In my shade garden this year I am concentrating on begonias, because they remind me of California! Rich, deep colors that are very south-of-the -border as they give off light here, in the grey, cold climes. I love the way you rave about the purity of it all! This spring I am going to try and revive my roses. Each year they start out great and then get a fungus and wither away. So I am going to try to stay on top of the feeding and spraying and hopefully it will be a good rose year. I would love to plant daffodils as well...I have a little hill they would look magical on. A ROSE! A VERY DARK RED ONE! Beth, how very fortunate we are to hear your fabulous adventures! I'm deeply grateful to be included in your flavor filled fragrant tale. We are preparing the top slope for raised beds. In the meantime, I'm planting African Blue Basil in pots for the my honey bees. I live up north (in Quebec , Canada), and our gardening season is still far away, BUT today, I planted three tuberose bulbs in a large pot; by mid june I will tranfer them to a sunny spot in my garden and hopefully they will bloom by the end of July. It is the first time I try this! now that's a good question, because i am fortunate enought to have two.. Our Sacramento garden has already been started (it never really stopped.) and provided cilantro to brighten the celery soup (also from the garden) that greeted me last night, fresh off the red-eye from Boston. We bought a new grapefruit tree, and of course, some tomatoes. Still worried about whether the rains of last month will ruin the crops, but hoping..
Begonias! My little back deck garden is very shaded, but the begonias never fail to bloom in profusion anyway. :) Probably also forget-me-nots and some mint, the only herb I can get to grow without lots of sunshine. Oh, I'm planting so many things. All sorts of vegetables and herbs, of course- heirloom tomatoes, many, many types of peppers hot and sweet, salad greens of many colors and tastes. But also flowers- petunias for a season of bloom they being such great workhorses, Queen Anne's Lace for the beneficial insects and bouquet filler, older sweet peas for their fragrance, morning glories, sunflowers. Most of my flower garden is perennials and shrubs, so I just have to wait for the roses (although I'm planting many more of them this year, where I don't know!) and iris and daylilies and peonies...but I always find more plants I have to add. I grew up in Los Angeles and both of my bedroom windows had a night blooming jasmine bush under them. I miss that scent so very badly- I tried growing them indoors up here but they did badly. I went back down to CA to help a friend move and when I discovered that the Star Jasmine was in bloom everywhere, I was quite an embarrassment with my nose constantly in the shrubs. basil, jalapenos, heirloom tomatoes and whatever calls my name at the nursery. We are trying to be more self sufficient, so most of my gardening will be for fresh foods. Though I have to plant more dill, chives and some pansies.I love their faces. it is a beautiful spring here in Devon,England following a rough winter (by our standards!) which pales into insignificance compared to Ohio. What it has meant is a sad inventory of the tender plants which can usually live here but didn't make it this year. So I will be replacing my beloved Melianthus major which I think I have lost. So some California sunshine smells would be great! I don't have a garden... I'll probably get a hanging pot of petunias for my balcony! More antique roses, iris, english dogwood. Would you like to take a peek? Thanks for the very lovely giveaway! My husband is going to build a little garden plot on our roof...the only place that gets more then 4 hours of sun and I will be planting kale, salad greens and tomatoes! I'm so excited about this. In our part sun - part shade garden I plan to plant more Japanese anemones. They do beautifully in our Oregon Coastal gardens. Thank you for your wonderful post today. This year tomatoes and basil in pots on the balcony. I used to live in southern California though and ever since I've want to have olive trees. Thank you for the great giveaway. I bought a house last year and I'm trying to determine what to plant. I'm not a green thumb by any sense of the word, but I would like to get lilacs on the property, so at this point, that's what I'm planting. I've just moved to a small place in Seattle, Washington. Everything's going into pots - crocuses, irises,lilies, herbs, heirloom tomatoes. I've had to move frequently the last few years and I'm going to "put down roots" and take them with me, if necessary, this time. Hi Beth. Your California sounds like a fun filled, sun dappled, feast for the senses. I love that you've decided to make a happy place in Ohio for now.As for my garden here in Georgia there will be rhubarb, corn, zucchini, peppers, lettuce. On the porch will be tomatoes and strawberries and under the porch is a blueberry bush. I recently read a perfume blog about GreenWitch by Roxanna and went to her site to learn more. I'm very interested in trying the Cimbalom. Thanks for offering this sample! Basil, oregano, Italian parsley, Curly parsley, African daisies, lemon yellow petunias, oxalis (2 varieties),Lavender, purple sage, Copper Canyon daisies, Blackfoot daisies, Alyssum, Caladiums, for starters. Also waiting for the wildflowers to pop. This weekend I planted mint, basil and cilantro. Marina: What on earth is branch water? I must try this, could you let me know how I could get some? I'm not planting in my garden this year -- October is the planting month and I missed my window. My garden, in which I used to spend endless hours, has become a source of great sadness since my neighbors pulled out a vine-like bush that spanned many yards atop my railroad ties retaining walls and bloomed pale blue flowers leaving me a view of all the junk they keep under their deck (not to mention orange sand bags). Opps - I thought the bi-line said "Marina" sorry, Beth! I have a new house and a new yard, so I've been very busy planting! Mostly I'm putting in drought resistant succulents, but also a lot of rosemary and lavender. I'm also putting up some tomatoes, because I love tomatoes, and they're worth all the water. I planted some days ago a geranium cutting and not it has beautiful pink flowers. I have planted a Garden Balsam too. It's growing so fast. I'm impressed. I would love to have a chance to try Cimbalom. Thank you! Unfortunately my husband and I are not lucky enough to have a garden or any land of our own, but we do keep indoor plants, as well as two flower planters in our window. We are planting herbs this Spring! a large collection of herbs, and I'm crossing my fingers that they will take off this year - but for some reason the ones I'm most excited about at the moment is the dill and the coriander. We'll be planting tomatoes, peppers, eggplants, possibly squash, definitely several herb varieties. I wish I could do zucchini but last year, the young ones kept rotting on the vine. I'm not sure why? It was heartbreaking. A lilac bush! I would love a little vegetable garden, but so would the deer and rabbits. Ah... this year I'll see if the lemon thyme from last year can be encouraged to "carpet" with a few more plugs, and putting in a border of either lavender or santolina. I'm also going to try to grow shiitake mushrooms. Planting, you must be kidding. The official planting time here is Memorial Day weekend. That's a full two months away. When that time comes, I will be planting herbs in pots for the steps to the upper level of my deck. I usually do rosemary, tarragon, oregano, curry plant, parsley, chives, garlic chives, chervil, and whatever else I can find. I also do a bunch of pots on the steps leading to our front door. For them, I do pelargoniums with a variety of trailing flowers for fun. Hanging baskets go on either side of the garage. Fun. Alas, no basil for me. It just doesn't grow in our climate. As for tomatoes. We only get to harvest in especially warm years. But hope springs eternal. Please enter me for the liquid Cimbalom drawing. Thanks much. I just planted 2 purple daphnes by the front gate, 2 miniature rhodies inside the fence, 2 corydalis-the blue one that is supposed to smell like gardenia, a flowering plum that tops out at 5 feet in the bed by the garage. Please enter me in your drawing. With my husband's happy consent, i am appropriating part of the front lawn near the porch for rose bushes. I'm planning an herb garden in the back, but will have to wait to recover from upcoming carpal tunnel surgery to really get started (though the basil I ursed through the winter is starting to look better already!) Thanks for the lovely post! I will be planting cherry tomatoes, basil, rosemary, jalapeno and sage. I wish I could grow night blooming jasmine here in MA, but alas, no go. I'm planting new azaleas this spring. Also, some monkey grass. We may get some patio tomatoes as well. We just started some arugula yesterday... can't get any fresher than that! I am planting catmint, parsley, iris, hosta, and gaura this year. If I can find the ones I want, I will plant some more azaleas too. I am trying to set up my first container garden, and it'll have rosemary, lavender, basil, mint, and lemon thyme, if I can get it all going. And I'm commenting because SoCal in the spring is indeed a lovely place to be! Sadly, I'm in an apartment and don't have a place to plant, but if I did I would plant tomatoes, pansies, and various herbs. Thanks for the draw! I kill plants so probably don't qualify for the draw. That said, two of the "ears" fell off my prickly pear cactus during the winter frost, and I shoved them in some soil in a little pot on the kitchen windowsill, and miraculously one of the pads has now sprouted its own mini-ear! I don't have much of a garden, I'm afraid, but I'm planting rocket in a pot out on the patio; it's great to have those yummy salad leaves always at the ready! This month I'm planting a spicy mesclun mix, pac choi's, arugula, lettuces, sugar snap peas, radishes, parsley. Later I'll add several varieties of basil, nasturtiums, tomatoes, pole beans. 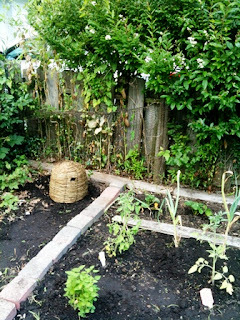 I have a very small gardening space in a community garden, but I plant densely and get a lot from it. Roxana's perfumes are composed with such care. Thank you for the giveaway. The only things I'll be planting are herbs in pots as we'll start renovating our home shortly. And perhaps tame the mint threatening to take over my front raised garden bed.... not that I mind really lol. Beth, what a beautiful post. Cimbalom is my absolute favourite of Roxana's perfumes that I've tried. I enjoyed wearing it through the winter months also, as it touches my heart in a way that gives me hope and reminds me of the spring to come. My word....I've never seen so many fabulous postings! I told Roxana that reading them was like weaving a fabulous spell for spring. I wish all of you wonderful luck with your gardens this year! As always, thank you so much for reading and letting me know that you enjoy my musings. I enjoy reading your comments as well and simply knowing that you're out there in internet land makes me very happy. All my love and brightest blessings for a very bountiful spring!